Longer hair (my wife's choice, though short now?!! ), tan complexion, heart rate at 58 BPM. I live in shorts, a t-shirt, and slaps, and drive a 2002 black Nissan Frontier with cap and boards/foil hanging out the back. This is a diary of living on the Outer Banks for a 40-something year old ocean sports enthusiast who works from home as a software engineer and windsurfs, surfs, and enjoys the beauty of these islands when "off the clock!" What is out there.... the Federal gov simply does not want people on the beach and will impose strict "No Trespassing" signs to keep folks out. At times, armed forces are on the beach with assault rifles to keep closures intact (though luckily have not seen armed forces yet this year). Is there some secret national security effort off Cape Point, or perhaps a crashed spacecraft?! Well.... no. Its nesting birds, or at least that is what we are told. Recently, one of best east facing surf breaks, Rmp 43 (as seen in the photo) has been closed to all access, both ORV and pedestrian. The claim is nesting birds which may be the case; however, why complete closure including paved roads and parking lots(Rmp 43 is completely closed off with nearest parking at the fish cleaning station at Rmp 44)? Additionally, why are so many other ramps closed such as Rmp 1, 3, 23, 34, 44 etc...?? Are these other ramps closed simply due to the human population expansion during the summer months on the OBX and a lack of NPS policing manpower to cover the numerous miles of beach? Note, even given the reductions in ORV due to permit requirement ($120/annual, $50/weekly), all these ramps remain closed... why? The introduction of permit sticker for ORV access is understandable and is a fine deterrent to complete open access, however, is the permit not enough? Are there still too many ORVs permitted during the summer months, and thus the additional closures are necessary? All in all, prior to 2008 this was never an issue. However, what happened in 2008 which set off a draconian beach access policy for our Hatteras beaches? Who specifically makes these access decisions and what is their basis? The nesting birds were always there and flourished fine for many years prior to 2008. 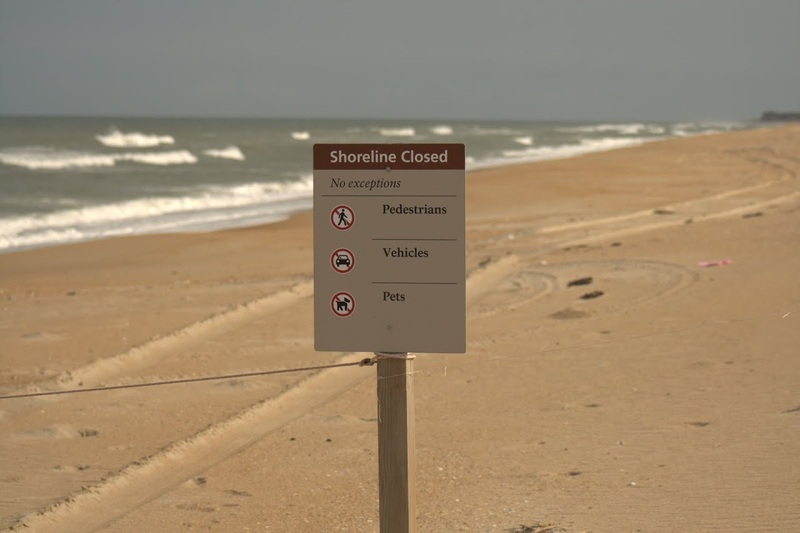 What was the tipping trigger that locked down access to Hatteras beaches? While I was in Buxton I emailed the NPS asking these same questions. I also asked for a phone # so I could ask an actual person these questions personally. I await a response. One of my questions- "Isn't the beach permit thing a scam?" may take some additional time for them to think through. In time I am sure their wisdom will present itself and I quiver with anticipation.
" What was the tipping trigger that locked down access to Hatteras beaches?" - radical environmentalists & activist judges who want to shut down Hatteras Island? When I was there in early June, I made the mistake of getting an ORV pass for the year..thinking I would use it again in Sept and didnt want the hassle of stopping to get another $50 week pass. Now I want my money back. It is a scam...no doubt about it. I'm sad for Hatteras Island. Bill, were you serious about the 'armed forces' part? Really? Yes, we saw armed NPS with assault rifles at a closure border near Cape Point back when the closures originally started. Likely it was a reaction to the bad local vibe it introduced, though we have not see this show of force in recent years (though I have not been down there as often as I used to). Likely though, the original decision to post armed NPS further inflamed an already sticky situation, and they have since not returned to that course of action. All in all though, indeed a show of force was present at one time during this entire debacle, though hopefully it will not resurface?! Maybe you will think twice before you again use your blog to support a political candidate affiliated with the party that has brought the vast majority of this insanity to the island. Yea, though likely regardless of presidential affiliation, we would have seen the same thing happen. This is purely a local issue spurred by a sitting judge (Boyle) appointed well before Obama, and a political machine in play that can game the system regardless of political side. Frankly, it was inevitable due to reasons which are beyond nesting birds and/or political affiliation. Waterturtle mentioned just before the closure a NPS person questioning everyone that was leaving ramp 43 if they fished and if so how many did they catch. I remember her. Maybe they were just getting a feel for the fallout of closing the whole frickin Cape. Still no response from the NPS to my inquiry. I remember when all this permit talk started the consensus from this blog site was this is a good idea. I hope you are happy with what you got. We use to visit the island three to four times a year, but have not visited since fall of 2011 and will not return for this reason. Actually the permit idea is a good one specifically as a way to address policing shortages in the NPS managed areas. The explosion of SUV ownership through the 1990s and 2000s is the true trigger for the restrictions. Again, this all started in 2007 when a jeep driven by a drunk college kid rolled while recklessly driving on an NPS managed beach killing three. That incident was the catalyst which set Judge Boyle into motion to rule on ORV restrictions. The "nesting birds" reasoning was secondary/complementary to the true reason for the restrictions which is a policing issue. Not sure why no one talks about this, and keeps looking at birds. Likely the reason is that in fact, the ORV proponents understand that indeed ORV ownership and beach driving expanded exponentially during the 1990s/2000s and the NPS policing manpower is simply not there to address it. All in all, a permit is a great way to cut ORV numbers to bring scope into a manageable policing effort; however, now other influences are in play which have extended the lock down making the Permit basically moot. June Hatteras Action Simply Continues! 6 Days in Hatteras Video! A New Year, A New Sealion. Introducing the 8'3"